The mobile user can be a fickle creature. They can have increasingly high expectations for always-flawless service, whether it’s making a simple voice call or having 20 apps open at the same time and streaming video. Yet it’s this same user who may arbitrarily turn off his phone or set strict usage limits in order to minimize the chances of “bill shock” when they use roaming services. For these reasons, the mobile industry places a high priority on having a real-time understanding of their users’ experience and being able to better cater to their sometimes quickly-changing needs. Chief among these needs is better serving the “silent roamer” described above – those users who minimize their risk of incurring dreaded high roaming charges on their mobile bill. Silent roamers continue to represent a critical opportunity for mobile service providers both as far as improving their subscribers’ experience as well as gaining new subscribers and higher revenues. First off, it’s important to understand the silent roamer opportunity. At Syniverse, we’ve been tracking this closely over the last few years, and we’ve developed an infographic to break down the sheer number of global silent roamers and the huge revenue opportunity they present. As you can see in the infographic, on the right, with some 1 billion people traveling abroad in 2018 and 70 percent not using data services, there are tremendous opportunities at stake in serving these users. But how can mobile operators tap into this revenue? Two of the most effective methods that we’ve refined at Syniverse are gaining the capability to gain an instantaneous view of a users’ connectivity needs, and then using this insight to serve those needs in a timely and relevant way. This involves using real-time data to understand and optimize the quality of experience for each user, and it also involves enticing users through personalized offerings and new services. Fortunately, new technology and service advancements are now enabling operators to take advantage of these methods and unlock a valuable market segment. Through our experience as a specialist in both real-time intelligence and roaming services, we have defined several best practices to help operators excel in improving customer satisfaction and delivering personalized offerings. Day passes – These controlled-usage plans offer subscribers the flexibility to sign up for a roaming plan based on the amount of data they consume but not incur data charges beyond a pre-established threshold. The plans offer a versatile way to give peace of mind to subscribers that they can keep their roaming charges within a certain range, and they represent a major improvement over the more traditional one-size-fits-all plans. At the same time, they allow operators a range of options for optimizing the subscriber experience and upselling other services. Day passes can be offered in advance or when a subscriber arrives at their location, and service extensions can be offered through text messages. New technologies now make it possible to offer a number of these tailored data usage and pricing plans that can be automated to target specific subscriber segments. On this front, Syniverse’s data on volume-based roaming plans has shown exceptional results, with one operator realizing a 27 percent month-over-month increase in roamers. And one South American operator saw its data roaming traffic rise 30 times as much as previous levels with the addition of a day pass plan. Real-time usage monitoring – Real-time alerting technologies now put the power of monitoring roaming usage control directly in subscribers’ hands, with interfaces that allow them to access usage information anytime and anywhere. This empowerment provides a powerful tool to avoid bill shock, and operators can offer a new dimension of service with this monitoring. In particular, as part of setting spending usage thresholds for roaming and, especially, data services, subscribers can elect to receive automatically generated mobile messages as they approach these thresholds. New technologies enable this through simple but dynamic tools that operators can use to not only minimize bill shock, but also to reduce customer complaints and the risk of nonpayment of roaming bills. Focusing on ensuring a superior quality of experience and delivering customized service offerings for subscribers can deliver a powerful solution for enhancing roaming usage. 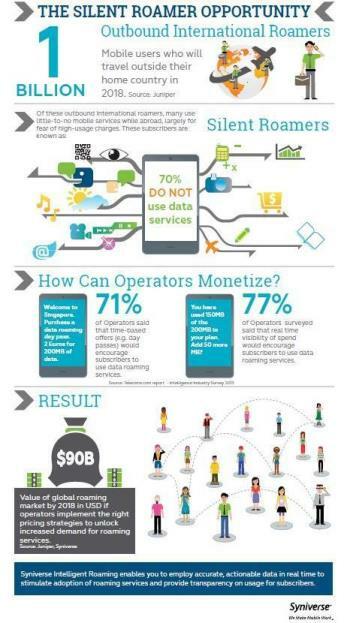 With today’s mobile user more fickle and discriminating than ever, operators must be able to take advantage of these capabilities to make clear the direct connection between their subscribers and the value that operators deliver to them when they roam. I would love to get your thoughts on this. What do you think are the best ways that operators can strengthen their roaming businesses? Do you think operators can significantly reduce the number of silent roamers in the next few years? Great Infographics- SYNIVERSE…Keep it up!